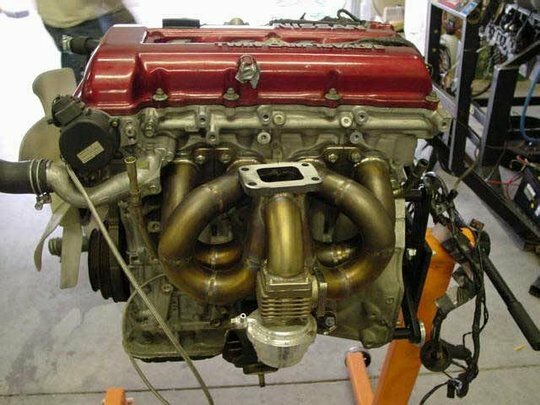 SR20DET (RWD) T3 ProStreet Turbo Manifold. This TOP MOUNT RWD SR20 manifold is a must for those seeking to extract maximum power from their S13 or S14 series chassis. Currently, this manifold is used by the highest whp record holders in the US! - Designed and manufactured in the USA. - Manifolds are fabricated from thickwall forged stainless steel. - Robotic TIG welded results in an extremely high quality weld. - Air conditioning and Power steering compatible. - Available for either T3 or T4 sized turbochargers. - Design allows use or large 3.0 in. downpipes.